I’ve got a story, “Cousins,” in the forthcoming Milwaukee Noir installment of Akashic Books’ acclaimed “city noir” series. I was absolutely thrilled to be invited to write about my beloved city again. In the case of “Cousins,” I’m writing about Silver City, the near-South Side neighborhood, part of which I represented for eight years on the school board. I bent the traditional hyper-hetero/cis gender noir genre for this story: The protagonists are a gay woman and her trans* cousin. The book launch event will be at Boswell Books in Milwaukee, May 7! Please join me and the incredible line-up of other Milwaukee writers who will be at this event. I would love to see you! Legendary novelist and short story writer (and fellow Milwaukee-lover), Joyce Carol Oates, asked me to contribute a story to another Akashic noir collection: Cutting Edge: Female Noir. I’m sweating as I type this because the other invited contributors include Aimee Bender, Margaret Atwood, Edwidge Danticat, and Valerie Martin. My story, “The Boy Without a Bike,” enlists another gay female protagonist in some “trailer park noir.” All signs point to this volume coming out in November 2019—more details as soon as I have them! 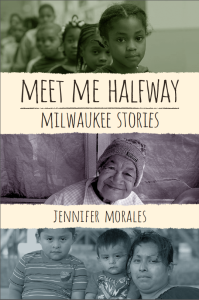 Meet Me Halfway, my collection of linked stories about life in hyper-segregated Milwaukee, is a semifinalist for the ScreenCraft Cinematic Book Competition. That means that this set of stories has survived the winnowing process from over 1,200 entries down to 125+. The winning author receives introductions to people who can help bring the book to the silver screen. I would appreciate your prayers and/or good thoughts toward the advancement of Meet Me Halfway to the next level. It’s so important that we have stories confronting race and difference right now—and the power of movies is unparalleled in helping people do that. Virtual Author Visit to Your Book Club! If your book club, community organization, workplace, church, school, or other group commits to reading Meet Me Halfway, I will make a Virtual Author Visit to your group (via Skype, Google, FaceTime, etc.) — for free! Just let me know via the contact form on this site and we’ll make a plan. Sign up for my email newsletter to get up-to-minute information on these and other opportunities.